Equally dreaded by those who live in big cities and have to experience it daily and by the others, who are not so used to it and have to face it once in a while. I have spent years in traffic and as much as I have tried to make that time useful by audio books and language drills, I consider the time spent in traffic not part of living, but part of being dead. It was only after I left the traffic hell of Dubai and moved to a smaller city that I thought of painting it. I don’t know why I got the idea. In retrospective, I think I needed to paint it to release years of compressed frustration. Here is the resulting piece. You can click on it for larger image. It is intense, claustrophobic, and crammed. It simmers with heat, fumes and faceless rage under the surface. The only reminder that there is a sky somewhere above comes from the violent sun which spits heat over the river of cars. You can almost hear the subdued roar of thousands of engines and feel the smell of hot metal and burning tires. Clenched fists on steering wheels, sweaty car seats. 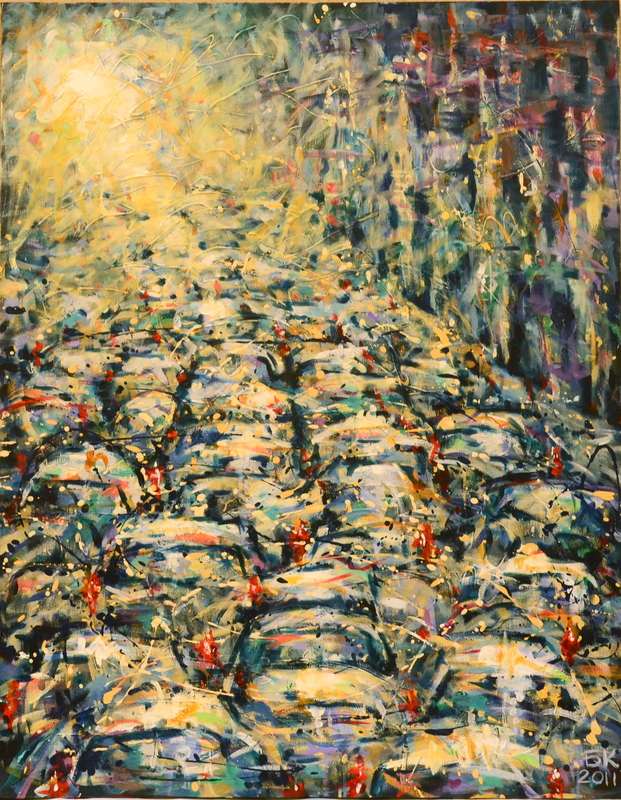 Traffic is one of the most sought after paintings I have done so far. 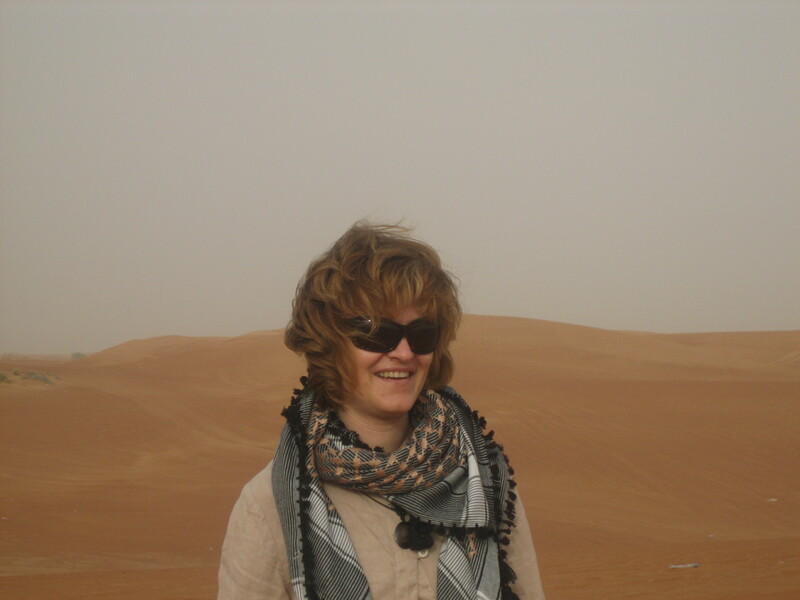 Now, the interesting part: it was bought by a friend of mine, who is on the worst possible side of the traffic hell – she lives in a satellite city of Dubai and for years – maybe 20 or more, has been commuting on the most jammed highway imaginable, 90% of the time under scorching sun. Why would she, of all people, would want to have Traffic on her wall at home? I have never asked her, maybe I should. Which leads me to the question – what are our motivations when choosing the images that define our personal space? The usual answers are: it is beautiful, it sets me in a certain mood, it reminds me of something – usually pleasant. When people feel something about a painting, but cannot express it, they would say ‘I like the colours’ – and this is a good sign. Better than ‘it will match my sofa’ anyway. There are other obvious motivations, though rarely declared, like ‘it demonstrates my wealth, social position, good taste’, but these are not within the scope of my interest. The mantra of the Western mindset today is ‘be positive’, no matter what. Then why do we voluntarily display images associated with unpleasant experiences, loneliness, melancholy, even suffering, in our personal space? I am not talking about museum type of art here, which is a different story. I don’t have an answer, and I would love to hear your thoughts. This entry was posted in Material for thought and tagged art, choice, culture, expressionism, mindset, modern art, motivation, painting, personal space, positive, traffic on November 27, 2013 by Boryana. Miss A.K. vs Miss P.E. Most people interested in art, and those who have seen the movie with the same title, have Vermeer’s painting in their memory. When I was setting up my portrait, I was not looking at it. I went on arranging my daughter following my feeling about her face, colours and character, keeping The Girl with the Pearl Earring in my mind’s eye. So my piece is not an interpretation of Vermeer, it is a portrait styled after his. Dear reader, comparing the two, and in the blogosphere at that, requires a good deal of courage on my part. I’ve been collecting it since 2011. Of course my painting is nowhere near Vermeer’s masterpiece in terms of artistic merit though it has a fair deal of character. The objective of the exercise is rather to put next to each other two young women, 500 years apart in time, of completely different backgrounds and mindsets and painted by two artists of quite different mindsets too. 1.The Girl with the Pearl Earring was not intended as a portrait but a stock character in costume, or a tronie in art history terms. Mine IS a portrait of my daughter Anna, and this is an essential difference. 2. Both girls were dressed up – in this case turbaned-up. In other words, both young women were taken out of their usual ‘state of head’ (pun intended) which brings them a tiny bit closer. 3. To paint this picture Vermeer was most probably using camera obscura – which produces a projection of the model on the canvas. I used a photograph to draw from – it is harder than tracing a projection but doesn’t make Vermeer any less of an artist and me any more of one. So, what do you think Miss Anna Kaleva and Miss Pearl Earring might have had in common if they were contemporaries? Would they be BFF or BFE (BestFrenEmies)? This entry was posted in Material for thought and tagged art, artists, camera obscura, comparison, expressions, faces, mindsets, painting, Portaiture, Portrait, styling, turbans, Vermeer, women, young women on November 20, 2013 by Boryana. It all started with a drawing, which I fell in love with at first sight. It is titled Gosho The Cattle Herd. Look at it. Simple, if not childish. What’s the big deal? There he is – Gosho with his herd, a bit scruffy in his patched trousers and galoshes looking at the cows with a Mona Lisa smile-smirk. The dark curly hair and the shape of his nose hint that he is probably a Roma, which fits with his occupation – hardly an aspirational one for Bulgarians, who largely consider themselves superior. You are not sure how to read his face – he appears listening intently to something, but there is also an air of contentment about him. He is right in his element, holding his crook with all the authority in the world. It is easy to draw and certainly looks like a cow. However the artist has chosen the much more challenging front view. His cows are facing You. In fact one of them is looking you right in the eye – SMILING! Standing out from the herd, balanced by the only one, which looks down, grazing, the smiling cow is the focal point of the composition. Then there is the cow behind Gosho, who has turned her head towards him giving him an affectionate lick. See how cleverly the artist has marked the meadow which the herd is in – just a little grass in front of the grazing cow – but somehow you know that there is grass everywhere. 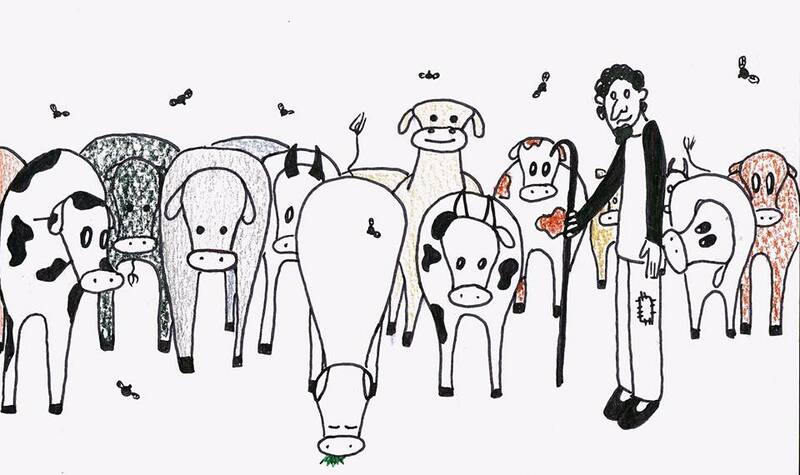 See how each cow has a character – do you doubt that Gosho can tell you all about them as if they are his children? And finally, notice how the the scene oscillates with movement – the flies and the cows tails wagging them away, the rhythm of the shapes and textures. What moved me in this drawing is the affection and simple joy of life that emanates from it, the subtle psychology of the narrative and the ingenuity of the visual language. This is most certainly a drawing from memory – it is immediate and non contrived. What talent, what sensitivity does it take to produce it, what originality! Who, on earth would choose Gosho the cattle herd as a subject matter of his artwork – and manage to tell all there is to tell about the most important things in life? His name is Anio. Although his parents are alive, he grew up in an orphanage – the most problematic one in the region of Sofia. His brother who was adopted by a foreign couple. He is still in college, though he is 3 years past the normal graduation age, and if he graduates (yes, IF) he will be the first kid from that orphanage to do so in the last 15 years. In terms of talent, I rank him in the league of Keith Haring and Jean Michel Basquiat. I don’t know if he will be lucky and resilient enough to realise his talent, but I am certain that for the rest of his life he will have his art as a place to go when he wants to escape from it all. This is Anio’s story – an open ended one. Anio is one of Milena’s kids. That’s how you ended up reading these three stories. If you want to find out more about Anio, or Embrace Me Association, please let me know. This entry was posted in Material for thought and tagged art, Bulgaria, charity, cows, drawing, education, gypsy, orphans, Roma, talent, upbringing on November 16, 2013 by Boryana. Today I want to tell you about a piece, inspired by a poem by Debelyanov, one of Bulgaria’s finest symbolists. Debelyanov lived a humble and not very happy life at the beginning of the last century and was killed in the First World War at the age of 39. His work was published after his death in two volumes, which are considered a classic and are part of the high school curriculum in Bulgaria. The painting as well as the poem is titled Do You Remember. The title might suggest that it is about memories, but if you dig deeper you will discover that it is about lost innocence, the irreversible passage of time and a lot more. Debelyanov’s poetry does not narrate but suggests deep and complex emotions impossible to name in simple words. It is this journey in the twilight zone of memory dissolving into subconsciousness that Debelyanov drew me in and which resulted in my piece. If you want to know the very words of the poem, a (somewhat literal, non-rhymed) translation follows. It takes a poet to translate another poet and although I have had a go at translating poetry (from Arabic at that), at present I am trying to be an artist. So the musicality and the poetic merit of Debelyanov’s verse will be lost for my non Bulgarian readers. To read it in Bulgarian, click here. Since my painting is not meant as illustration of the poem but a contemplation inspired by it, I am showing it first. You can click on the image to enlarge. the quiet home amidst the white cherry blossoms? Oh, do not awaken in my prison those distant sorrows and forlorn memories. and my punishment – the days of the past. Whispers and laughter amidst the white cherry blossoms? the choir of angels from the days of the past. They must have been a dream … the white cherry blossoms. 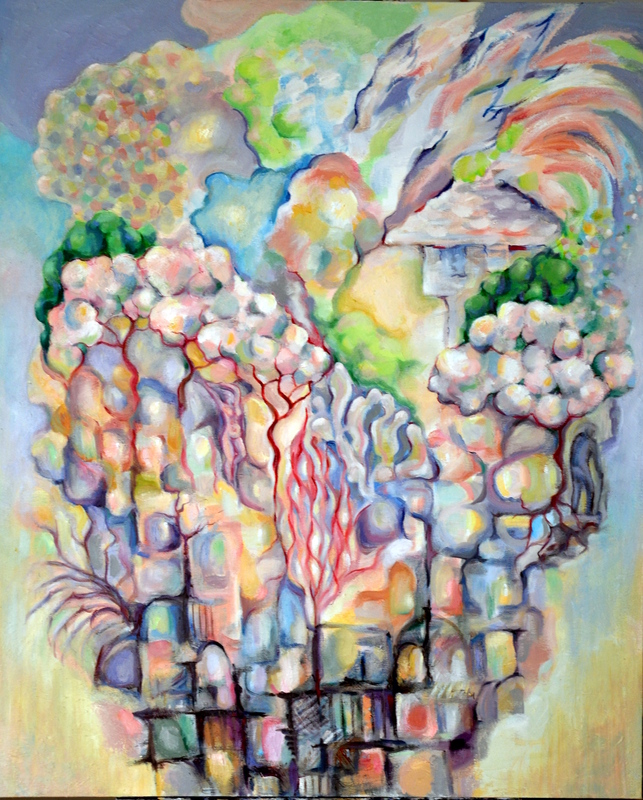 This entry was posted in Material for thought, Zoom In and tagged abstract painting, art, Bulgarian poetry, Debelyanov, memories, painting, poetry, subconscious, symbolism on November 13, 2013 by Boryana.